One of my favorite elements of my job as a Personalized Learning Coach is to give parents, community members, and other teachers tours of our school. We call these tours Learning Walks. I structure learning walks very much like most of the teachers in my school structure their lessons. There is a brief introduction to what we have done in the past and what we want to accomplish. We then dive into the content by touring classrooms and chatting along the way as ideas emerge. Then we end with a debriefing and reflection on our learning. "....but this seems like it's a lot more work to me." These two statements brought me back to a task that I completed for the Personalized Learning course that is driving this blog series. This last week's assignment was to complete Learner Profiles on four different students from a class, and then design a plan for making the work more accessible to them. When I initially began analyzing the data from the profiles, I tackled the process with a very traditional lens. I thought that I would gather the information, analyze it, and then create a plan that would have me, the teacher, planning ways that the students could better access the information, engage in the learning process, and express what they had learned. My next steps traditionally had me, the teacher, doing all of the work in the future. This is is what we have always done in the past. Teachers have designed all of the accommodations. Then we have been the ones who decided when, where, and which accommodations every child would have available to them for every activity that crossed their path. Now I don’t know about you, but reflecting on our past practices, this model is what seemed like a lot of work to me. My change in thinking came when I shifted my lens from differentiation to personalization. The accommodations put into place shouldn’t be about a teacher owning all of the work that makes learning more accessible to students; they should be about a teacher helping a student internalize their strengths and weaknesses. Accommodations should be seen as strategies that a student can use in multiple ways that can establish an environment where learning is accustomed to them. Not an environment that a teacher as created, but instead one that the teacher and student built together. For the learner who has difficulty focusing online: Copy and paste work onto separate pages of a Doc or slides of a presentation. Then when they are finished, merge them all back together. For the learner who likes to work in groups: Use programs like GAFE to share work with peers even when working alone for critique and feedback. For the learner who cannot think of ways to begin: Keep a journal of interesting first sentences in books, movies, commercials, etc to steal from when you are beginning writing pieces. Its strategies like these that keep students engaged in the learning no matter the content, environment, or task. Helping students build this capacity is a lot of work for the teacher in the beginning, but the fruits of this labor are immeasurable. 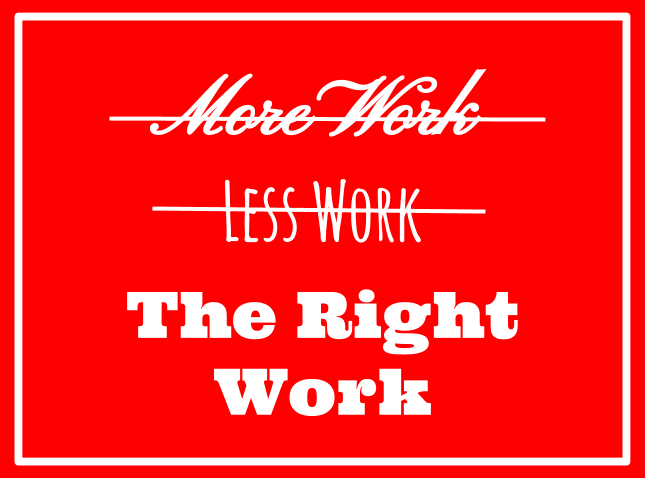 It isn’t more work, and it really isn’t less work either. The way I would describe it is...it is the right work. I understand the pushback and hesitation that surrounds Personalized Learning amongst particular groups. I especially appreciate it when that moment comes, and you see performance start to slip as a result of change. It is a natural reaction that when things get difficult to go back to what worked before. The issue with that is what worked before didn’t work. It wasn’t the way that children learned best. Ironically, the way that children learn best is not new information. This concept isn’t some breaking news story that is challenging everything we have always known about learning. Educators have always worked with these principles in mind. The understanding of how children learned best grew roots back in the early 1900s with the work of a Russian psychologist named Lev Vygotsky. His theories help solidify the need of a teacher or facilitator in a Personalized Learning Environment (PLE). He believed that all functions that children have appear in two separate phases, “first, on the social level, and later, on the individual level.” This concept strengthens our understanding of why constant check-ins and anecdotal observations guide so much of a teacher’s planning and instruction in a PLE. Teachers must first notice or create an environment where a student experiences a learning opportunity, and then they can intervene and model appropriate strategies to make sure that when that same student encounters a similar challenge he or she has the understanding of how to approach the task. In Fulton County, we associate this sequence with the Personalized Learning Principle of Just-in-Time Direct Instruction. Along with Just-in-Time Direct Instruction, the act of Co-planning Learning supplies the perfect balance. Once again, this isn’t new information or a new process. The work of John Dewey encapsulated this belief dating as far back as 1899. Dewey rejected the fact that external rewards served as sufficient motivation. He understood that intrinsic motivation is what fueled the learning process. When a child feels included in the process of their education, then you see a different student emerge. You see a student who sees value in their work and efforts. A student who now is developing skills that they can transfer outside of the classroom. This intrinsic drive is a sustainable motivation in contrast to one that is dependent on grades and other types of rewards. That kind of external motivation can often put a period on a child’s experience. That is where the work of Carol Dweck builds so beautifully on Dewey’s research. She elaborates on his concept and introduces the idea of reinforcing a child’s self-image of having a Growth Mindset versus a Fixed Mindset. This Growth Mindset helps children as they continue to take ownership of their learning behaviors. It allows them to partner with teachers and see that as they set, monitor, and reflect on learning goals that the process of learning can eventually belong to them. This environment is an empowering one to establish inside of our schools as opposed to models where students feel as if learning is something that teachers dispense when they feel it is appropriate for the entire class. In the more recent past, attempts at personalization and doing what was best for learners sometimes got muddy. There were paradigms that came along to help teachers differentiate the way that they delivered instruction or asked students to demonstrate their understandings. You might remember teachers asking you things like, “Do you learn best by seeing the information or by hearing it?” Or maybe you remember filling out surveys that pigeonholed you as an “Intrapersonal Learner” or labeled you as being “Mathematically Minded.” The issue that we see with this is that it limits the child. Someone labeled as being “Verbal/Linguistic” according to Howard Gardner's theory of Multiple Intelligences would naturally shy away from tasks that required Mathematical thinking. Or even worse, a person who identified themselves as an auditory learner would lose out on the skills developed in the other lobes of the brain such as problem-solving and understanding language. The same goes for a visual learner who now is focusing all of their brain power on the parietal lobe and neglecting the temporal lobe that facilitates memory. That is why teachers are diverting from this practice and focusing more on Universal Design for Learning Guidelines. These guidelines focus more on the what, how, and why of learning. These guidelines focus on how students access and process information, how they express what they know and understand, and how each student engages with the content and concepts within a lesson. These more certain pathways into the essence of a learner help teachers as they facilitate the process of learning. It is this attention to detail that has led us out of the efficiency model that has dominated our schools since the Industrial Revolution to our Personalized Learning Environments that are more effective means of working alongside children. Imagine the sketches of Renaissance put into the hands of aerospace engineers of today. The whole time DaVinci knew what a gyroscope needed to fly. Now the men and women at Lockheed Martin can take his ideas to a deeper level. This evolution of belief is the legacy of personalized learning as a model for how learners learn best as described 100 years ago by the likes of Dewey and Vygotsky. It is this legacy of partnership and support. A legacy now coupled with the science of metacognition and motivation. We have traveled beyond opinion and belief. We are no longer committing to work with children based on beliefs. We have emerged in a place of science. A place where if we ignore the work in front of us we could be guilty of malpractice. Educational Malpractice. Personalizing Learning at the elementary Level? Then Pbl is essential. 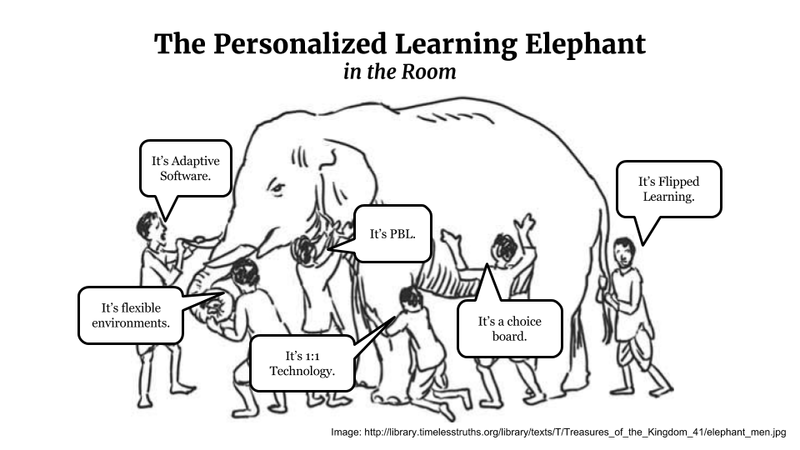 “Are they, or are they not Personalized Learning?” This entire post was inspired by the parable where the different blind men are feeling the parts of the elephant and swearing up and down that it is many different things. One man says it’s a fan, and the other says it’s a snake, the other a tree and so on and so on. When comparing Adaptive Programs, 1:1 Learning, The Flipped Classroom, Blended Learning, and Project-Based Learning you, most importantly, have to be purposeful when selecting the lens through which you choose to view them. Some might argue that some are tools while others are environments. Other people might say that some could put more responsibility on the learner while others place more on the teacher. For this piece, I am going to look at this through the lens of an elementary school teacher. At the elementary level, an ideal way to personalize learning using one of the above topics would be to implement Project-Based Learning (PBL) into your curriculum. Here is why. The most authentic PBL is not about content consumption. At its core, it is about the process and not the product. It is our duty as elementary educators to teach children how they all learn. There is nothing more personal in this entire world than the act of learning. So, to be a teacher who truly personalizes learning, you must commit to facilitating a child’s journey to discover how he or she learns. The structure of PBL allows us to do this alongside children. Formulate questions, culminate ideas, revise and critique concepts and processes, present findings, reflect on it all and then start all over again. This is the cycle of learning. If teachers can focus on making this the breath of the elementary experience, then when our students grow into their secondary education imagine the skill set that they would bring with them to tackle more complex and abstract concepts. In Reggio Emilia, they begin this process early with the child. In preschool they allow projects to emerge from the children’s interests and the teacher becomes the invisible hand that guides throughout the process. In their 1995 book Le fontane: From a project for the construction of an amusement park for birds, Malaguzzi and Piazza explain the role of the teacher in the Project-Based process eloquently stating, “The teacher’s task is to be a mediator, offering carefully measured and pertinent loans of knowledge and skills, periodically producing summaries of the children’s convergent and divergent elements and the points of arrival of their work, to highlight the emerging meanings, and to solicit the participation of each and every child increasingly cooperative and productive interaction” (20). The following is a short recording that I created to document the first of ten assignments that I am completing alongside the Professional Learning Team in Fulton County. We are in the midst of a deep dive into personalized learning, and here I will be discussing one of the major pieces that I feel is the glue to our work: Co-planning Learning. I remember it like it was yesterday, a parent stopped me in the hallway and asked, "How is Jason doing in math this semester?" I very confidently replied to her, "Jason currently has an 87 in math." Then, as she turned away I realized that I was doing everything wrong. ​ I taught first grade for five years before transitioning to fourth grade. In first grade, cultivating a personalized learning environment is very easy. As a matter of fact, it is almost something you do in order to survive. In the lower grades, it is necessary to create separate spaces for students to transition between due to their attention spans being shorter and their need to move in order to "get their wiggles out". Small group instruction and individual conferencing are an absolute must as well because five-year-olds rarely listen to you unless you are speaking directly to them. Then I decided to transition to fourth grade....and everything changed. I was sitting in a classroom of 29 students. The CRCTs were looming at the end of the year. Grades (real numeric ones) were supposed to be reported and put into TAC in a timely manner. I was also seduced by a perceived independence that was exhibited by almost all of my students. Surviving in the upper grades felt very different than what I was used to in first grade. That "perceived independence" that I referred to kept me from creating a personalized learning environment in my classroom. All of the other things I listed before that made teaching in the upper grades so difficult felt balanced out by the fact that I didn't have to work in as much time for small group instruction, choice in learning opportunities, or even making concrete connections to my student's interest. It was this passing conversation with a parent in the hall about a math grade that changed the way I saw the work I was doing with my students. Personalized Learning is just good teaching. It is the difference between saying, "Jason has an 87 in math," and, "Jason is working hard on comparing fractions using benchmark fractions." It's about putting whatever you need to aside so that you can spend as much elbow to elbow time as you can with your students. Once I realized this, I changed everything. Now, I didn't do it all at once. I addressed the issue in small manageable pieces, and every time I did something would fail. Nothing catastrophic, but always something that needed to be improved upon. I took note of all of these things and in my pursuit of trying to create the most ideal, or personalized, environment for learning it all started to come together. It was at this time that I decided I wanted to start working alongside teachers in order to help make this happen inside of their classrooms as well. Far too often teachers are given an objective and not the proper tools to execute the task. They are told things like, "Create a workshop environment in your math class," but then they aren't given the steps that it takes in order to make this happen effectively. I worked hard for many years creating, applying, and reflecting on ways to make a personalized learning environment possible in all grades at the elementary level. Now I want to share this with others. Not because I think that what other teachers are doing is wrong, but because I know what it feels like to do it both ways. It is that second way, the "Jason is working hard on comparing...." way that is the most rewarding way to spend your time inside of the classroom. Not only for the teacher, but also for all of the students. Barnwell Elementary is a Group 3 school in Fulton County's Personalized Learning initiative. Transparency is essential to our growth as we learn what Personalized Learning means to our community.